We caught our first glimpse of an unknown Tesla prototype testing at the old Alameda Naval base yesterday, and now we've got video of what could be the Model 3 or the Model X stretching its legs and squealing its tires. Is This Our First Glimpse Of The Tesla Model 3? 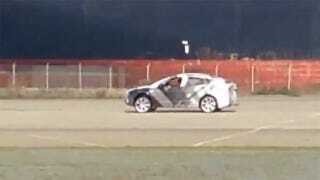 We're still not convinced what model Tesla is testing. It has a profile reminiscent of the Model X that's due to go on sale later this year. But it still looks too small to be Tesla's Model S-based SUV, so we're sticking to our previous assumption that it's one of the first prototypes of the Model 3, the $35,000 mass-market EV Tesla is promising in 2017. Elon Musk recently said that he wants the Model 3 to be "different from any other car on the road," something that's "really useful." Based on the profile, there are certainly shades of Toyota Prius in there and we know that Musk likes hatchbacks, but since this is obviously such an early prototype it's impossible to conclude anything about the styling or functionality. What it does have is a fair amount of body roll and that blood-curdling sound of understeer while running a loop, but we're still at least two years away from even seeing a concept of the Model 3, so we'll keep the judgement calls to a minimum.